This data set contains images of fractional cover estimates of photosynthetic vegetation (PV) canopy, nonphotosynthetic vegetation (NPV), and exposed soils (S) derived from Landsat images (30-m resolution) obtained for two ranches in the Brazilian Amazon from 1996 to 2002. The Fazenda Vitoria ranch is located in eastern Para near the city of Paragominas and is a mosaic of primary forest, logged forest, secondary forest, and pasture with moderately dissected topography. The Fazenda Nova Vida ranch is located in the state of Rondonia in western Amazonia and is a mosaic of primary forest, logged forest, and pastures. 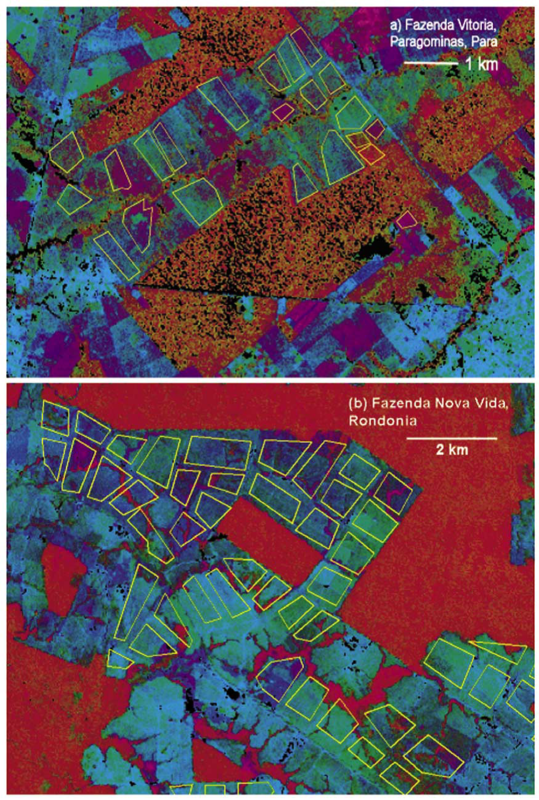 For Fazenda Vitoria, two dry-season Landsat images were obtained, subset, and analyzed. For Nova Vida three dry-season images and one end-of-wet-season image were obtained, subset, and analyzed. Spectral mixture analysis, which decomposes individual satellite pixels into constituent cover fractions of surface materials, was used with a general probabilistic modeling approach to derive subpixel cover fractions of PV, NPV, and S.
There are six GeoTIFF (.tif) files with this data set. Figure 1. False color images of Fazenda Vitoria and Fazena Nova Vida. Shadows and water appear as black, and remnant mature forests appear as red, owing to high values of PV. The pastures appear with a range of colors, indicating various combinations of S (blue), NPV (green) and PV (red). Yellow indicates a mixture of predominantly PV and NPV, whereas magenta indicates a mixture of predominantly PV and S. Pasture management units are indicated by yellow polygons (Davidson et al., 2008). The investigators were Davidson, Eric A.; Almeida, Arlete ; Araujo, Thereza Cristina; Asner, Gregory Paul; Costa, Fabiola Fernandes; Ishida, Francoise ; Leal, Eliane Constantinov; Leao, Luciene Mota de; Leite, Tania de Sousa; Markewitz, Daniel ; Oliveira, Patricia Chaves de; Pacheco, Nilza Araujo; Rosa, Maria Beatriz Silva da; Sa, Tatiana Deane De Abreu; Saba, Renata Tuma; Schuler, Marysol A. E.; Silva, Marilia ; Silva, Patricio de Souza; Souza, Cleo Marcelo Araujo; Stone, Thomas A. and Vasconcelos, Livia Gabrig Turbay Rangel. You may contact Stone, Thomas A. (tstone@whrc.org) and Davidson, Eric (edavidson@whrc.org). Data are presented in six GeoTIFF (.tif) files. The files are named by site, rondonia or maranhao (for the Para site), the Landsat path row, and image acquisition date (MMDDYY). "mcuscaled.means" indicates that the Landsat images were processed by the AutoMCU model as described in Section 5. Band values: Values are stored as 16-bit signed integers ranging from 0 – 1000. * standard deviation caused by uncertainty in both the reflectance values (after atmospheric corrections) and the spectral end-members. ** error between the spectra of the image pixel and the spectra produced by mixture of the end members. This represents the error or level of certainty in the modeled result. Higher values mean a less accurate modeling of the image pixel's spectrum. Resolution of Landsat images is 30 m.
The data set covers the period 1996/07/06 to 2002/05/22. These data can be used to identify areas of significant differences in the fraction of PV, NPV, and bare S between areas under different management regimes at two large ranches in the Amazon Basin. At the western site (Rondonia, Fazenda Nova Vida) images from the wet and dry season also allow an analysis of seasonal effects on fractional cover. These fractions were determined by using an automated Monte Carlo simulation algorithm that determined the fractions for each pixel given libraries of spectral end members for PV, NPV, and bare substrate. One challenge in assessing intact forests is the significant component of shadow in remotely sensed imagery, which can be mistaken for water or bad data. Seasonal variation in forest and canopy structure is a concern of which we are aware. In addition, interseasonal rainfall regimes can be highly variable and cause discrepancies. We did not have direct access to the digital GIS data from the ranch at Nova Vida and had to map it using a rubber sheeting technique which has inherent uncertainties particularly at the edges of the maps used. One of the images for the Fazenda Vitoria region had significant cloud cover but fortunately not directly over our area of interest. As mentioned in our paper (Davidson et al., 2008), we do not know how recently or frequently cattle were rotated through pasture management units and when other management activities occurred relative to the date of each scene. This potentially introduces additional temporal variation. Fazenda Vitoria is located 6.5 km northwest of the town of Paragominas, Para State, Brazil, in eastern Amazonia. The 3,500-ha ranch is a mosaic of primary forest, logged forest, secondary forest, and pasture with moderately dissected topography. The areas that are now in pasture and secondary forest were originally cleared and burned in 1969. After 6 to 8 years of pasturing, some of the area was abandoned to fallow. Areas that continue to be actively managed for cattle pastures received management inputs such as disking, P fertilization (50 kg/ha), and planting with an African grass (Brachiaria brizantha) in the late 1980s. Fazenda Nova Vida is located directly adjacent to BR-364, 50 km from the city of Ariquemes in central Rondonia in western Amazonia. Small amounts of forest on this 19,000 ha ranch were cleared for subsistence settlements as early as 1911, but large-scale land clearing at Nova Vida began in 1972 and continued with additional areas cleared in 1979, 1983, 1987 and 1989. Almost no new forest clearing has occurred since 1989. The ranch is now a mosaic of primary forest, logged forest and pastures. Nova Vida contains no abandoned pastures and almost no areas of second growth vegetation. Pastures at Nova Vida were planted directly from forest to Panicum maximum, Brachiaria humidicola and Brachiaria brizantha and managed by application of the herbicides picloram and 2,4-dinitrophenol and occasional burning through the 1990s. Management since 1998 has included mechanical clearing of woody debris, additional herbiciding, disking and application of lime (0.6 Mg/ha) and rock phosphate. Landsat imagery was obtained for Fazenda Nova Vida in Rondonia (path/row 231/067; 11 August 2001): dry season -- 6 August 1999, 24 August 2000, and 11 August 2001; wet season -- 26 May 2002. Landsat imagery was obtained for Fazenda Vitoria in Para (path/row 222/62); dry season -- 5 July 1996 and 6 June 2000. A subset of each image was extracted to focus on the ranches and the surrounding area. All images were geocorrected to a common map projection (UTM zones 20 and 23, datum: Clark 1866), and were composed of 30-m-resolution pixels. Prior to analysis, sensor gains and offsets were applied to the imagery to convert from digital number to exo-atmospheric radiance. The radiance data were then passed to a fully automated version of the 6S atmospheric radiative transfer model (Vermote et al., 1997). Aerosol optical thickness and water vapor data taken from the Moderate Resolution Imaging Spectrometer (MODIS) sensor onboard the NASA Terra spacecraft were used as inputs to 6S as described in detail by Asner et al. (2005). For the Landsat image collected prior to the launch of Terra, we used the long-term average MODIS aerosol and water vapor data from the same month of collection (July), a technique that has proven reliable for correcting Landsat imagery for the spectral mixture analysis approach that is used here (Oliveira et al., 2007). These steps provided estimates of apparent surface reflectance for Landsat bands 1 through 5 and 7. We used the AutoMCU model (Asner and Heidebrecht, 2002) to decompose each Landsat pixel into fractional cover estimates (0 to 100% cover) of PV canopy, NPV, and bare S. AutoMCU is fully automated and uses a Monte Carlo unmixing approach to derive uncertainty estimates of the subpixel cover fraction values. The method uses three spectral end-member bundles derived from extensive field databases and satellite imagery (Asner et al., 2004, 2005), to decompose each image pixel. Solving for the subpixel cover fractions requires that the Landsat TM and ETM+ reflectance contain sufficient spectral information to solve a set of linear equations at different wavelengths. The end-member reflectance bundles used in the AutoMCU code were compiled from field and satellite data as described in detail by Asner et al. (2005). Although no spectra were collected in the field in Rondonia, the AutoMCU method, which allows for uncertainty in end-member spectral properties as well as Landsat spectral calibration (Asner et al., 2005), has proven sufficiently generic to allow its use across a wide range of vegetation and soil conditions throughout Brazil and Peru (Asner et al., 2003, 2004; Oliveira et al., 2007). The output from the model included subpixel PV, NPV and S along with standard deviations caused by uncertainty in both the reflectance imagery (following atmospheric correction) and the spectral end-members. Asner, G. P., and K. B. Heidebrecht (2002), Spectral unmixing of vegetation, soil and dry carbon cover in arid regions: Comparing multispectral and hyperspectral observations, Int. J. Remote Sens., 23, 3939-3958, doi:10.1080/01431160110115960. Asner, G. P., M. M. C. Bustamante, and A. R. Townsend (2003), Scale dependence of biophysical structure in deforested areas bordering the Tapajos National Forest, central Amazon, Remote Sens. Environ., 87, 507-520, doi:10.1016/j.rse.2003.03.001. Asner, G. P., A. R. Townsend, M. M. C. Bustamante, G. B. Nardoto, and L. P. Olander (2004), Pasture degradation in the central Amazon: Linking changes in carbon and nutrient cycling with remote sensing, Global Change Biol., 10, 844-862, doi:10.1111/j.1529-8817.2003.00766.x. Asner, G. P., D. E. Knapp, E. N. Broadbent, P. J. C. Oliveira, M. Keller, and J. N. Silva (2005), Selective logging in the Brazilian Amazon, Science, 310, 480-482, doi:10.1126/science.1118051. Bastos, T. X., and T. D. Diniz (1982), Avaliacao de clima do Estado de Rondonia para desenvolvimento agricola, Bol. Pesquisa 44, Embrapa- CPATU, Belem, Brazil. Clapperton, C. (1993), Quaternary Geology of South America, Elsevier Sci., New York. Jipp, P., D. C. Nepstad, K. Cassel, and C. J. R. D. Carvalho (1998), Deep soil moisture storage and transpiration in forests and pastures of seasonally- dry Amazonia, Clim. Change, 39(2/3), 395-412, doi:10.1023/ A:1005308930871. Markewitz, D., E. Davidson, P. Moutinho, and D. Nepstad (2004), Nutrient loss and redistribution after forest clearing on a highly weathered soil in Amazonia, Ecol. Appl., 14(4), 177-199, doi:10.1890/01-6016. Oliveira, P. J., G. P. Asner, D. E. Knapp, A. Almeyda, R. Galvan- Gildemeister, S. Keene, R. F. Raybin, and R. C. Smith (2007), Land-use allocation protects the Peruvian Amazon, Science, 317, 1233-1236, doi:10.1126/science.1146324. Projeto Radambrasil (1978), Levantamento de recursos naturais, Dep. Nac. de Prod. Miner., Min. das Minas e Energ., Rio de Janeiro. Sombroek, W. G. (1966), Amazon Soils: A Reconnaissance of the Soils of the Brazilian Amazon Region, 300 pp. Pudoc, Wageningen, Netherlands. Vermote, E. F., D. Tanre, J. L. Deuze, M. Herman, and J. J. Morcrette (1997), Second simulation of the satellite signal in the solar spectrum, 6S: An overview, IEEE Trans. Geosci. Remote Sens., 35, 675-686, doi:10.1109/36.581987. Davidson, E. A., G. P. Asner, T. A. Stone, C. Neill, and R. O. Figueiredo. 2008. Objective indicators of pasture degradation from spectral mixture analysis of Landsat imagery. J. Geophys. Res., 113, G00B03, doi:10.1029/2007JG000622.